This detailed map covers the southern part of Carshalton and Wallington. A small portion of Carshalton, around Carshalton Hill, is in the NW corner, and coverage continues eastward to Manor Road and Wallington station. Between them is Carshalton Park. At the foot of the map is the hamlet of Carshalton-on-the-Hill where the absence of gas and water brought Mr Sligg's development to an abrupt halt. Barrow Hedges is in the SW corner, Woodcote Hill in the SE. Directories for Carshalton Road, Manor Road and Pound Street are on the reverse. Crohamhurst. 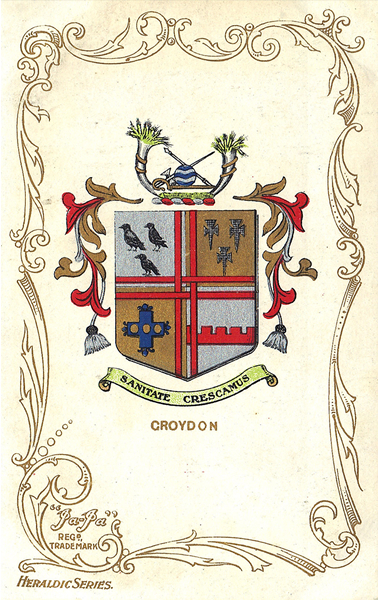 On the reverse are street entries for Brighton Road, Bynes Road, Croham Road, Crunden Road, Haling Road, Sanderstead Road, Selsdon Road. You might find this Index map useful. The map links up with Surrey Sheet 13.12 Carshalton to the north, 13.15 Sutton to the west, 14.13 South Beddington to the east.